On Sundays, when I get home from my long run, I usually drop my gym bag on the loungeroom floor, and jump straight in the shower. This is my dog’s favourite time to get into things that she should not be getting into. She has a big basket of toys, but would rather play with my dirty socks or hair elastics. 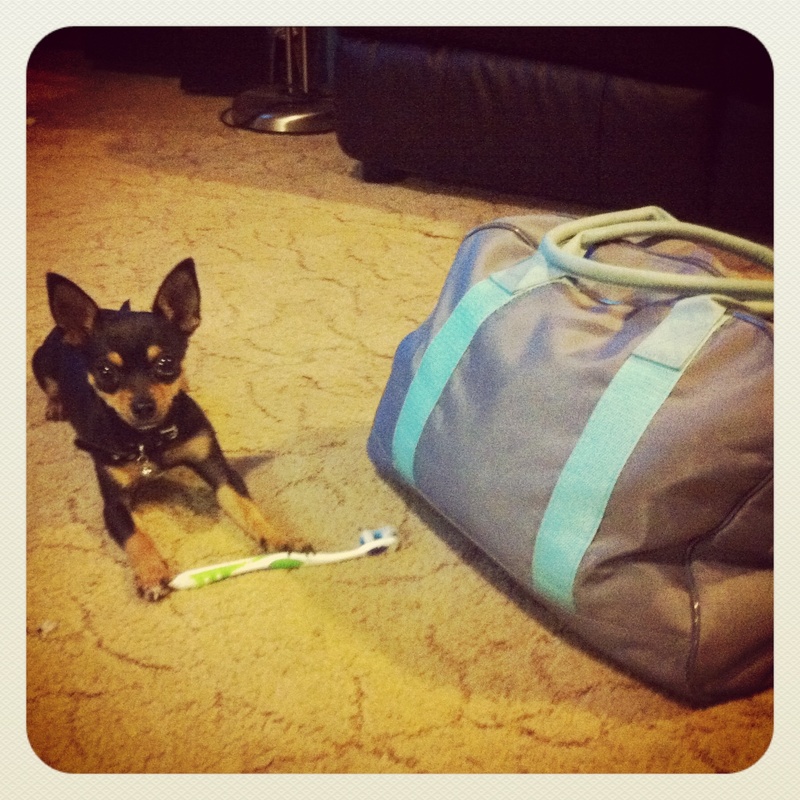 Tequila likes to help herself to things in my gym bag. Errrr… You can keep that one. Sometimes, she gets in to things she shouldn’t. (She only ever does this on Sunday mornings). She has chewed my glasses. And a protein shaker. Recently, I came out to find that she had gotten into one of my GU’s. Oh no! I thought. This can’t be good. She only weighs 2kg. Should I call the vet? Hmmmmm… Not reccommended, but not necessarily no. The main concern seems to be the maltodextrin, which forms the base of GU – it is the source of carbohydrate. Maltodextrin is derived from corn. And apparently, many dogs are allergic to corn. 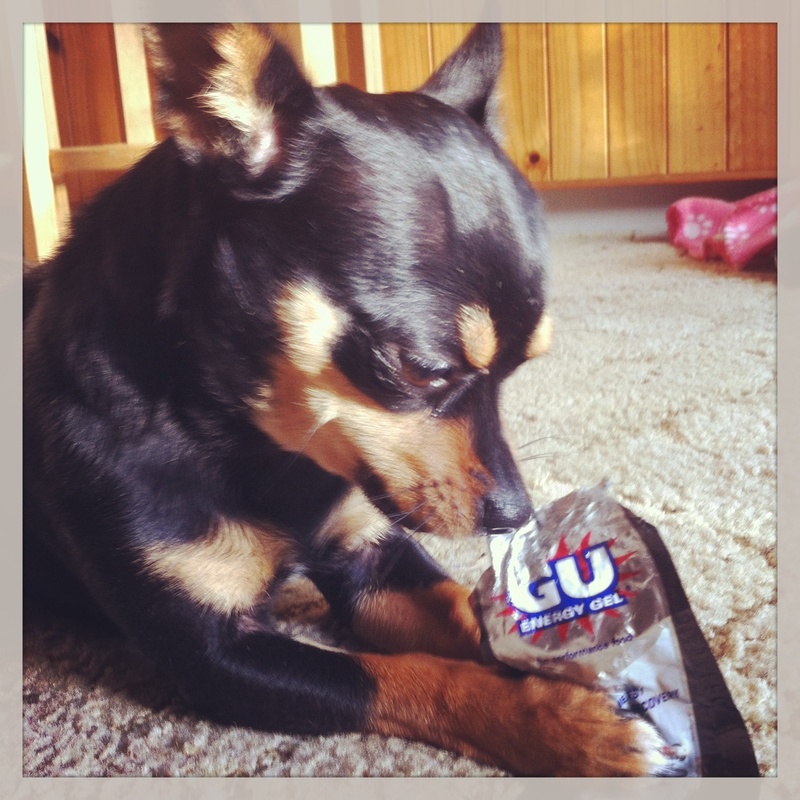 So if your dog is allergic to corn, maybe keep your GU stash well out of their reach. The other two concerns of mine were chocolate and caffeine. It’s common knowledge that chocolate is pretty much dog poison. (Poor dogs!) This is due to the theobromine, found in highest amounts in dark chocolate. The Chocolate flavoured GU’s actually contain real chocolate. Luckily she didn’t eat a chocolate one. 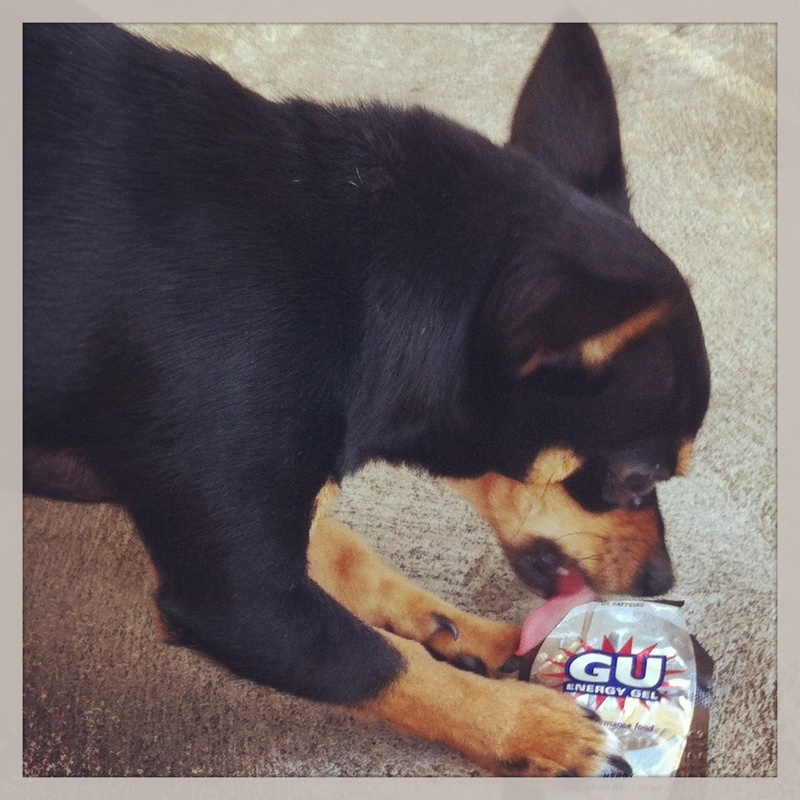 Some GU’s contain around 60mg of caffeine. I tried to find out how much caffeine would be a lethal dose for a dog. The LD50 (Lethal dose required to kill 50% of dogs) is around 140mg per kilo of body weight. So 1 GU hopefully won’t cause too many doggy deaths, it can still cause hyperactivity, restlessness, elevated heart rate, hypertension, sound familiar? Similar effects to humans, except magnified because the effects are related to body weight. So while I certainly would not recommend sharing an energy gel with your 4-legged canine friend, my dog is probably at greater risk of ingesting one of my sweaty worn socks. Are you sure that’s a dog? !